One of the main ingredients of beautiful body health is even simpler - hydration! – and that comes from giving our body pure, fresh, water.It’s my favourite drink. I turn on the tap and there it is – something that helps me feel refreshed after a big work-out and something that I know my kids are benefiting from so much as they grow too (way better than fizzy, sugary drinks that harm their teeth and actually make them thirstier). But imagine not having access to clean water? Imagine your child being thirsty and sick and you not being able to provide this one, basic relief! WaterAid’s Water Challenge In March When I found out that WaterAid runs a Water Challenge each March, I was passionate about supporting it. To me, fundraising for an important cause like this just makes perfect sense. And you can join me too. It’s a fun challenge that really makes a difference – not just for your own better health but the improved health of people all over the world. It’s all about raising awareness that more than 650 million people around the world don’t have access to clean, clear water. 650 million! It’s about raising money too – WaterAid’s Water Challenge in March is all about closing the gap on the heart-breaking world water inequality. How YOU Can Help – 650 Million Reasons To Drink Water I love, love, love it when things are easy to support and tell your friends about and this one is as easy as it gets. With World Water Day coming up on March 22, WaterAid Australia is challenging Australians just like you and me to take the Water Challenge to improve their health and help raise money to provide life-saving, safe water in some of the world’s poorest communities. When you help raise funds for WaterAid’s Water Challenge, you feel good in more ways than one – you know that you’re doing something that matters. The money raised will to help local partners set up practical and sustainable water, sanitation and hygiene solutions that meet the real needs of some of this planet’s poorest and most marginalised communities. Did you know that even $70 can give a child access to clean water and help them avoid life-threatening illness? Plus – and this bit really got to me – when children don’t have to spend hours of each day just walking and looking for water, then carrying it back to their communities, they actually have more time to do the things healthy, happy kids SHOULD be doing. Playing, going to school and just being kids. Seems hard to give up your daily latte fix? But think of people with no water and how your commitment to stick to this March challenge for just a couple of weeks can really make a difference. If you've been following me, you'll know that I LOVE using technology for food and fitness inspiration. There are so many cool apps that help you keep your health on track and you can use the timer on your phone to remind you to keep your water consumption up while you're on the challenge to keep you on track and your donations flowing in. A reminder to drink a glass of water every hour? You can do that. Want to make your water more...interesting? 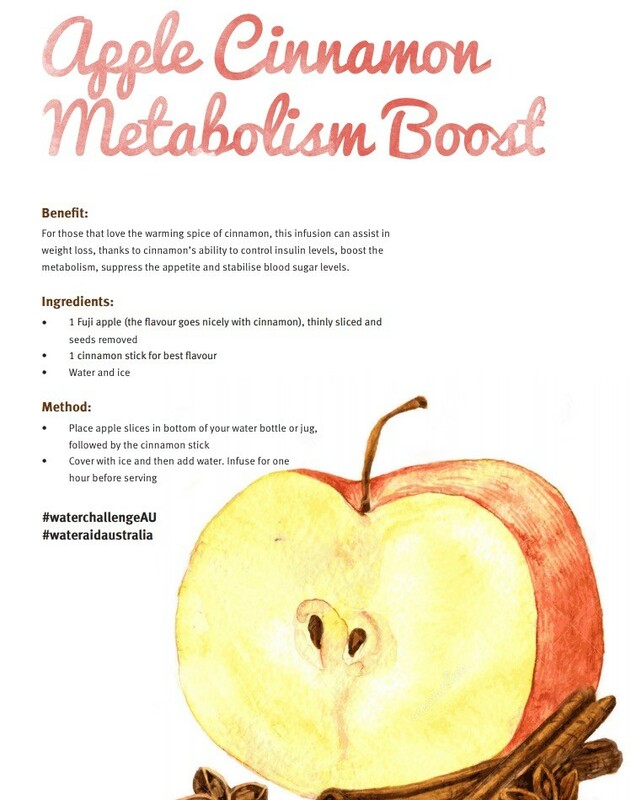 Apple Cinnamon Metabolism Boost it's all about INFUSION. And the added health benefit to your body? Because cinnamon has the ability to help control your body's insulin levels, boost your body's metabolism AND suppress your appetite, it can also help with weight loss! Then there's the Watermelon & Mint Work-Out Water - Yum! It's a fantastic way to replenish your energy after you tackle some of my exercise tips - re-hydration the natural way, without all the added rubbish of sugary 'sports' drinks. You CAN do it! Water rocks! What are you waiting for? It is free to register for the Water Challenge (sign up at www.waterchallenge.org.au) and choose your challenge; Drink Just Water or Walk For Water. I’d love to hear how you’re going. Tag#WaterChallengeAU to show me how you are keeping hydrated! How amazing that we can all make a different together – and improve our own health at the same time! Drink up, people! Let’s get moving! Monday Meal planner with Push Ups!